Hayslip was born a Vietnamese peasant in 1949; little more than 20 years later she left for the United States with an American husband. Her early years were spent as a Viet Cong courier and lookout; a black marketeer; an unwed mother; a bar girl; a hospital aide; and (once) a prostitute. She was tortured by the South Vietnamese army, raped by Viet Cong, and harassed by Americans. 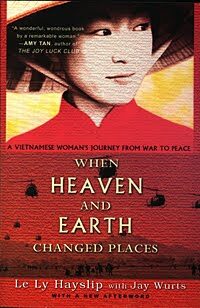 This story is juxtaposed with the tale of her difficult return to Vietnam in 1986. Her account is a part of the Vietnamese conflict that we seldom hear, of the survivors in the middle; it concludes with a plea for both sides to put the war behind them. Frankly written, moving, and meaningful, this is highly recommended for adult and academic collections.